Smart companies know that investing in their business doesn’t cost – rather, it pays. However, when it comes to investing in good design, there is often a reluctance to find the budget – despite the huge value of professionally presenting your marketing and communication material with great design. It is so often the case that when times get tough or when savings need to be made, it’s the creative budget that faces the first cuts. And, to be fair, this is understandable – particularly when it comes to small businesses and startups with limited resources, though even larger enterprises often have a blind spot when it comes to design. The problem is that business owners and directors often only see value in a small handful of activities such as operations, customer acquisition and retention, and improving margins. 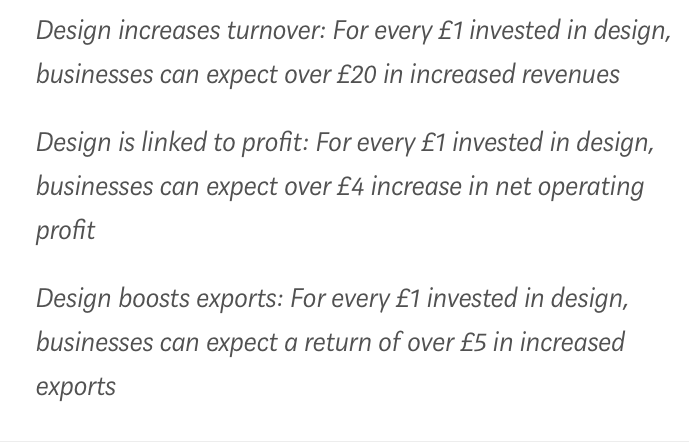 These all have a simple and measurable ROI (return on investment), and so budgets can be easily justified. The impact of design, however, is a lot more difficult to measure. But the difference between “mediocre” and “great” is vast when it comes to design, and companies often fail to see how making an investment in design will feed into those other top priority metrics they care about. Of course, everyone wants a beautiful website, a smart logo, and eye-catching marketing assets – but the fact is that many companies simply aren’t willing to pay professional rates for these things, and they’re doing themselves a disservice. The reason is that they will instead often ask an employee, without adequate training, to “have a go” at DIY design, with results ranging from unexciting and commonplace at best, to absolutely appalling (business-crushing) at worst. Alternatively, they will start trawling the web for cheap options, and end up hiring a self-proclaimed “professional” with dubious credentials who will, in the end, let them down in one way or another. The most successful companies know that great design pays back more than it costs. Let’s take a look at five reasons why investing in great design is a smart move to make. Let’s clear up the most important issue first. Naturally, your company will be motivated by numbers first and foremost, so you need to know that if you’re going to invest in good design, it’s going to pay off. It will. In fact, numerous studies over the years have shown that design-led companies enjoy greater turnover and greater profits than those which don’t place an emphasis on design. … And they’re 94% design-related. Companies should never forget that they only have one single opportunity to make a first impression – be it with customers, potential employees, or investors – and first impressions can make or break a deal in the blink of an eye. Indeed, a study by Research at Google found that web users form an opinion of a company after just 50 milliseconds of landing on a website. This is all it takes for someone to build an initial “gut feeling” that informs their decision over whether they’re going to stay on the site, or leave. What the study found was that both visual complexity and prototypicality (i.e. how representative a design looks for a certain category of websites) play crucial roles in the forming of an aesthetic judgement. This all happens in incredibly short timeframes of between 17 and 50 milliseconds – faster than the blink of an eye, which takes anywhere between 100 and 400 milliseconds. To provide some clarity – what these results show is that if a website has a high visual complexity (lots of clutter, options, text, and other elements), users perceive it as less beautiful, welcoming and engaging, even if the design is familiar. By the same token, if the design is unfamiliar (i.e. it has a low prototypicality), users perceive it as less visually pleasing, even if it is simple. In short, users prefer website designs that look both simple (low complexity) and familiar (high prototypicality), and you’ll damage first impressions if you deviate from these expectations. Design is an art – and to ensure that you’re giving users what they want, you’ll need to invest in good website design if you don’t want to lose them. It’s not just your website that will benefit from good design, but all of your marketing and indeed packaging materials. Have you ever been to a restaurant or perhaps watched a cooking show on TV and noticed just how much effort chefs put into presentation? Sometimes it can even seem as though they put more care into the aesthetics of a plate than the actual cooking of the dish itself. Why? Because chefs and restauranteurs know that we “eat with our eyes” first – and so too do good designers. We’ve seen above how people form first impressions of a website by “eating first with their eyes” – but this concept extends to all of a business’s visual materials, and smart design can even control how people perceive a brand and its products. In his fantastic book Blink: The Power of Thinking Without Thinking, Malcolm Gladwell notes that even slight changes or tweaks to the packaging of certain products can significantly change how people perceive and even taste them in the case of food products. 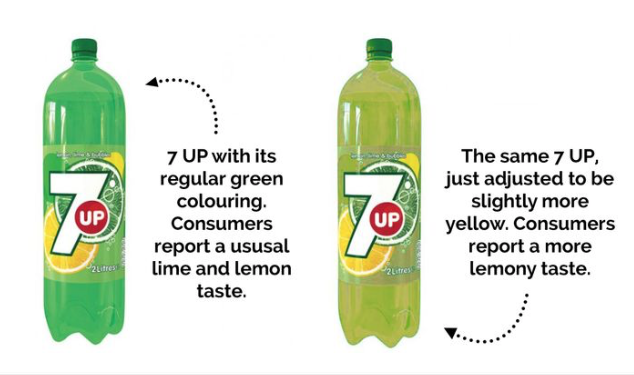 He notes that adding 15% more yellow to fizzy drink 7 Up packaging leads to people reporting a more lemony flavour, even though the drink itself is the same. On cans of Chef Boyardee Ravioli, a picture of a real human face influences perceived quality more than a cartoon character. And in the Hormel logo, it was found that adding a simple sprig of parsley to the logo causes customers to perceive the products as being fresher. It’s true that we eat with our eyes first, and indeed Gladwell’s findings prove just how legitimate good design practices are, and thereby the importance of investing in them. Making specific and calculated design decisions will indeed make a huge difference in how consumers will perceive your brand and consume your products. The last thing you want is for your company to be forgotten. How many products or brands can you picture in your mind perfectly, and yet cannot for the life of you remember the company name? Quite a few I’d wager, and that’s simply because good design is memorable in ways that words and names just aren’t. Human beings are far better at recalling visual cues than they are anything else. I’ve discussed in previous blog posts how great brands are created. I focussed on the importance of personality, PR, and customer service – but, on a purely surface level, it’s good design that will make your brand memorable. 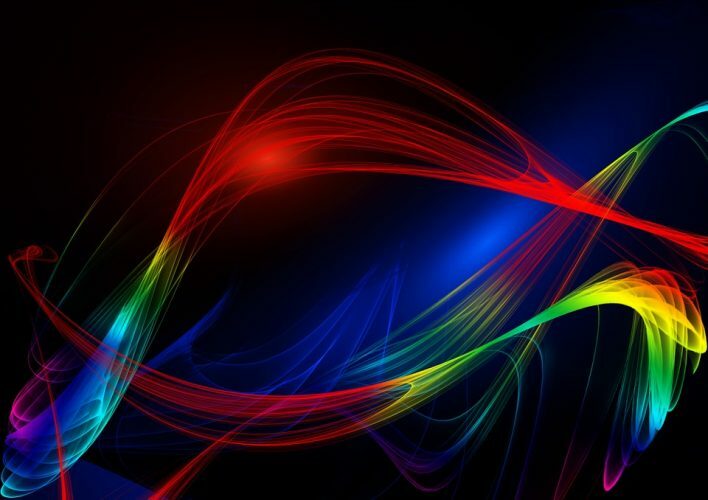 Often it’s the colours – on packaging, marketing materials and websites – that consumers will remember, even when they forget your name (think of the red and yellow of McDonald’s, or the primary colour spectrum of Google). Investing in professional graphic design will see that precise colours, fonts, typography are used right across your business, ensuring that customers and potential customers have a consistent experience no matter if they’re handling a product in a store, visiting your website, or engaging on your social media feeds. And this is important, for it will make your brand more recognisable and memorable, as well as reinforce professionalism. Working with a professional designer will mean that you will have the chance to pull upon their expertise and ensure that the message that you’re putting out there is the right one. DIY design is all well and good if you want to save your company a few quid, but at what expense if you’re portraying the wrong image to your customers? Investing in design means investing in professionalism. You will be able to sit down with your designer, discuss your ideas with them and devise design concepts together. A good graphic designer will take the time to understand your brand, your message, and what you are trying to achieve with your marketing. If you’re not a design professional, then you will be relying on guesswork – particularly when it comes to the psychology of design and colour. Of course, you will know some rules of thumb – red is romance, perhaps, and green is fresh. But what about the interactive effects of colours? What about colour schemes? 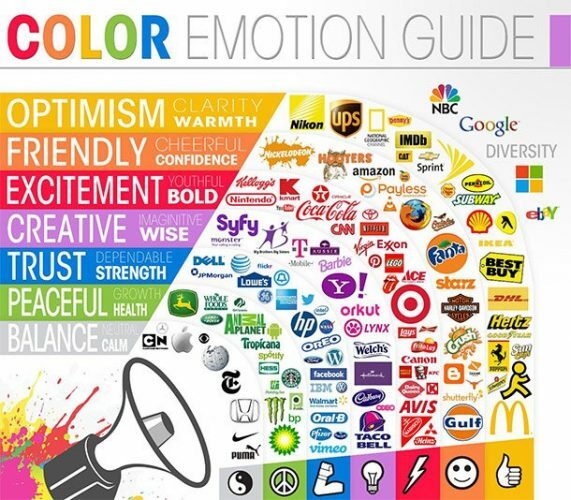 These are far more complicated, and the relationship between brands and colours often hinge on the perceived appropriateness of the colours being used. Also, it’s important that your brand is recognisable from the crowd. There are lots of brands that want to express their green credentials in their branding, but if they all resorted to that colour, then no one would be able to see the wood for the trees. In this sense, a graphic designer will be able to help you pick a colour scheme that at once differentiates your brand from your competitors, yet still communicates the right message and elicits the right emotions that you want to be associated with your brand. Getting design right is of paramount importance to the success of your business. From first impressions to making your brand memorable and communicating the right message, investing in good design is a good business decision. Great design gives you a competitive edge, drives powerful marketing results, and ensures your brand stands out. If you need help forming a creative design strategy for your business, get in touch with us here at Cope Sales & Marketing – www.cop-salesandmarketing.com. We’d love to hear from you and will be very happy to chat through your requirements.